Access allows us to use "Copy", "Paste" and "Cut", not only on the same Table, but onto different ones. These are the same actions we can often use in Windows. First, Access allows us to select a piece of data, a cell, a field, a complete Record, a column or a group of rows and columns ...simply by using our mouse. After we have selected the data we want to copy on another Table, we can select the option "Copy" after clicking on the right button on your mouse. When we are working with different Tables, Access will create a duplicate of the data we have selected in the Clipboard. Access will keep this data stored even if we were to close the table, a Data Base, or even the program itself. This allows us to paste this data onto different tables. 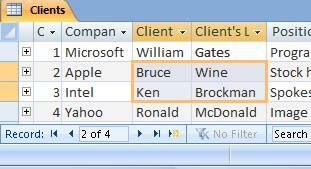 For example, Access will paste the data in the same order as we copied them originally. 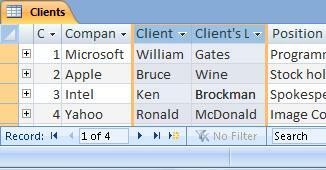 If the Origin Table has more fields than the Destination Table, Access will not paste the remaining fields. On the other hand, if the Origin Table has less columns than the Destination Table, Access will leave the remaining fields blank. Access will prompt us to confirm if we want to paste these Records. We can encounter some problems when pasting data. For example, when the data we are trying to copy is not compatible with the Data Type of the field, we won't be able to paste, let's say, a column with Text Data Type onto a column with Number Data Type. Also, we won't be able to paste data when the data is larger than the Destination field. Or, when the data forces a duplicate in the Primary Key or onto any Indexed field without duplicates.